There were 668 press releases posted in the last 24 hours and 153,500 in the last 365 days. 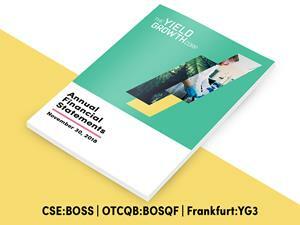 VANCOUVER, British Columbia, March 22, 2019 (GLOBE NEWSWIRE) -- The Yield Growth Corp. (CSE:BOSS) (OTC:BOSQF) (Frankfurt: YG3) on a consolidated basis (the “Company”) has released its financial and operational results for the year ended November 30, 2018. These filings are available for review on the Company’s SEDAR profile at www.sedar.com. Urban Juve is an Ayurveda-inspired skin care and beauty brand that rejuvenates and nourishes from within: spirit to skin. Urban Juve’s key ingredient - cannabis sativa hemp root oil - combines with natural and pure essential oil-based formulations to create quality products that are now available online and are available at select retail stores across Canada.